If you like drawing symmetrical repeating tiles or mandalas, this program is for you. It’s easy to use, and the line quality beats most of the competitors. This program also has a few geometric shapes that you can use as basic lines/scaffolds in your designs. It gets a little grumpy with doing more than about 5 undos in a row, but give it a few seconds and it will catch up. This program also supports the Apple Pencil, and lets you select what attributes and how sensitive you want the program to interpret the Pencil. I first got this app to work on pieces but quickly saw how effective it is to unwind and relax. Very happy! I really wish this app wasn’t’ so difficult to navigate at times. I wish when you press the home button which I’ve done on accident... i have to exit out of the app completely because there’s no way to go back to the design. I also wish there was a gallery with your saved work instead of it just being deleted and no way of accessing it again. If there is one then it’s definitely not user friendly in some ways if it’s that difficult for me to find. Other than that I love the app and it really helps me to relax and have fun with different designs. This app truly fascinates me. I have created over 100 patterns in 30 minutes. This is one of my best tools to have. I love this app, works great. Best out there, but here's what could make it better. When drawing, the drawing "surface" doesn't have to be so big. When trying to undo more that 4 inputs At a time the program freezes. I never have to zoom out so far as it allows, I think making the surface smaller would stop lag. Also the ability to have more than 3 layers would be great, also the ability to visually isolate layers/ name layers etc. lots could be done with layers that would improve intricate design making ease. 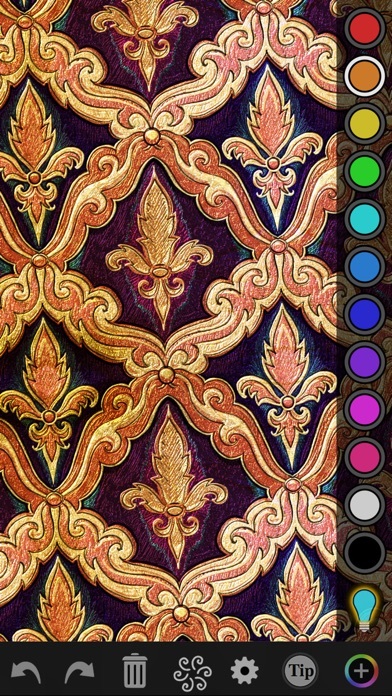 This is hands down the best program for exploring wallpaper patterns and rosettes available on iOS (and possibly on any other operating system). The interface is great, the program is easy to use — and the mathematical explanations that are available for further exploration are excellent. It is worth every penny it costs, and you should also do the in-app upgrade to unlock the extra features, which are also awesome. I really do like this app, and it has a lot of promise, but its UI is not that great and the UX is even worse. I have the pro edition and do think it’s worth it, but man, it’s very unintuitive. It could really benefit from a work over by a good designer. I find it so unpleasant to use that I frequently just quit in annoyance. Great app! Thank you for your work! I would love to see this app continue to develop with more artistic options. Great work so far. Cheers. Drawing is just as fun watching the animation of it after. Love the glow brushes - learning the maths now - planning to get so serious - like 17 ways ! Quite an amazing app. Tons of educational material in the app if you're interested, but it's not needed to have fun and make some beautiful designs. I'm recommending it to family and friends. I've been fiddling with this app for about an hour now and it's provided some great entertainment! The user interface is a little confusing. And the tips are helpful but there's no good way to search or access specific information. For instance, there is an animation feature that replays the strokes you've made in chronological order. It plays every time you change ornament groups. It seems to me like there should be a way to turn that feature off. It gets in the way of my creative flow. If anyone knows how to do this and could pass that information along to me it would be greatly appreciated. Apart from this one issue the app is very engaging and stimulating. I look forward to exploring it more. So good, I love it. One request: that you could save the piece so you could work on multiple pieces at a time. Thanks! Mind blowing intersection of math & art!! This app is phenomenal beyond description!! Going to purchase an Apple Pencil for the primary purpose of this incredible app. Love the new 3D feature (accessed via computer). Kudos to the developer with gratitude for spurring my interest in geometry!! The very first line I drew on this made me say "WOW!". After a month of playing with it I still find myself saying "wow". Without a doubt the most entertaining drawing app I've had in 8 years of owning Apple devices. Get this app!! This app works okay, but after purchasing it, you find that if you want to access half of the features, you have to pay to upgrade. I'm still finding it confusing but if you buy the upgrade you can make spheres. So many possibilities. My interest in group theory and topology drew me to the app. I love that the app has both a tool for creating images AND a mathematical presentation. So wonderful! The authors have a sensibility for the beauty and magic of mathematics! The best and getting better! This app is my go to app for drawing patterns and mandalas and just keeps getting better and better with each iteration. This app is a great companion to any artist. Excellent for projects, as well as for relaxing. Hours of mesmerizing magical entertainment, even without an ipad pro & pencil, but add them & wow! Worth every single penny! ❤️it! This is the most amazing and fun art app on the Internet, and it gets better with each new iteration. Must be tried to be believed. Dan C.
This is by far the best of the apps of this kind that I have tried. I use it all the time to create components of my digital fine art. And the in-app purchase is worth it. The extra tools and features are awesome. I'm so grateful for this app. Looking forward to the new version! Glad there is higher resolution. You can create such beautiful and interesting works, inspiring works with this app. It's quite fascinating! I have much to learn about the mathematics behind the images one can create in this app, but one doesn't need to understand this math to create beautiful images. With the new, higher resolution, I now can make plans to print my favorite works. This is so much fun to use. I feel it's such a privilege to have this app. Thank you for putting so much effort into iOrnament, for keeping it updated and for improving it. I'm looking forward to what I will create with the pencil and the iPad. So much to explore! Best regards to all who are responsible for bringing this app to us. It's truly a great gift, and I'm so grateful to have it. There are absolutely no apps out there to equal iOrnament in what one can create with these drawing tools. Worth so much more than the cost to buy this app. 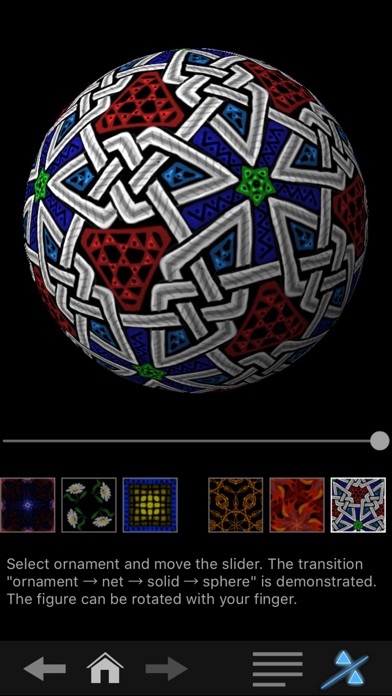 There are so many different ways one can use this app, integrating the artwork into other artworks, such as the spherical ornaments. I have always enjoyed using it, and now with the new, higher resolution and the Apple pencil, so many new possibilities have opened up. (Though you do not need the pencil to use and enjoy this app, so don't let that deter you) There is so much to explore. It's infinite! Thank you again for this wonderful drawing tool! I tried this app because it seemed to have more features than others similar. But The dark interface in not very intuitive and I don't see why I cant change the background for a solid color, what I found here was just the option to choose from some predefined background textures and play with their colors. I think that would be nice if it was possible to change the background to only a solid color. But overall, the app works well and it has a lot of features to draw. 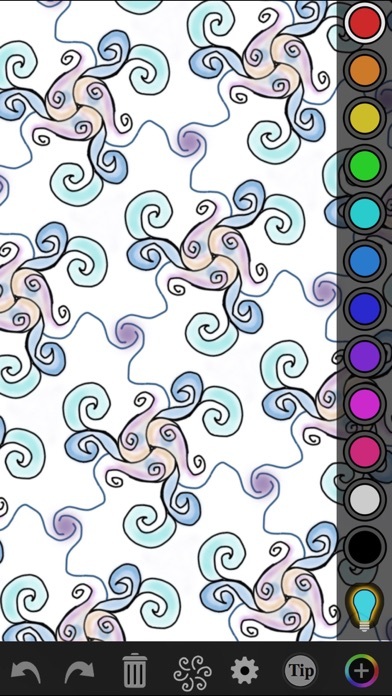 I absolutely love this app.....the ability to draw seamless tiling patterns is my favorite feature! This is one class app. I keep discovering new ways to play. The app works decently but it's disappointing to see its deleted hours of work on one of my pieces because of apparent instability. Bummer. Best App around for drawing! It's easy an affordable! Love the format& only limited to my imagination! Thanks, katwomanSavage. So originally I gave this app 3 stars. It's print quality was low and the background stuck on back. I messaged the developer to tell him why I rated it at 3 stars. He asked what would make it better. Then he proceeded to fix every single problem I had with it. Now it's quality is great, the brushes are perfect, there are tons of options for everything, and the designing is easy. The best part is that it's very easy to use right away, then as you get more comfortable and explore, you find more and more options. It's very beautiful and full. I'd list is as one of the top 3 apps an artist NEEDS. This is a fun app to play with, but I think the real value is in its explanatory text. I recommend this app. This app will bring your art to a level you never thought was possible! BEST iPad Pro drawing app by far! I love this app a lot. I've been getting into drawing patterns, mandalas and Zentangles a lot lately and this app turns my doodles into amazing patterns and works of art. I have even uploaded some of my newly created patterns to a couple POD sites that I put my art up on. 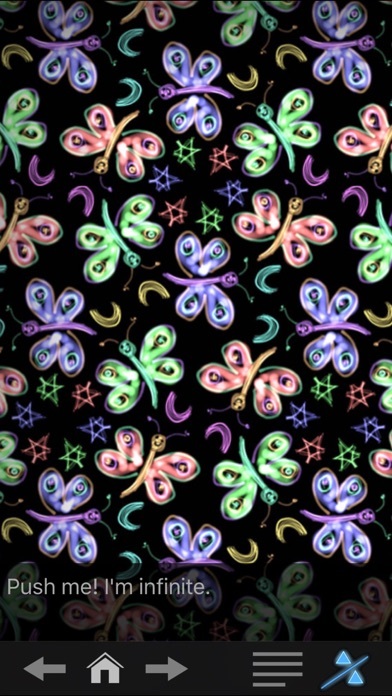 I'm sure these patterns will make great phone cases and more. One thing that I kinda was hoping for eventually is a higher resolution output as I am still on an iPad Air 2. iPad Pro is definitely in my future but a ways off. Second I was wondering if we could get a smudge brush. That would be great for blending and smoothing color transitions. Overall, excellent app! This app is amazingly useful to explain ornaments and patterns. The math explanations are well paced and really help to understand with the illustrations and interactive widgets. Update' May 2017 the new update has added just about every feature I wished for, and the integration with Crafter is mind boggling. so ugly. would give zero stars if possible. The app was good before but was a bit quirky to work with, the update give you lots more options. I would like a even more control over the size and shape of my brush in a future update, it would be nice to not only adjust the size but the taper as well! More layers would be great too and a real color wheel for color selections. I’ve been using this for a couple years now and every time I think “I wish I could...” that feature has been included in a new update. So many possibilities, I’m still just scratching the surface. The new emboss and ability to create a variety of symmetries within one design is fantastic. I could use it for hours. Lots of potential uses including math and art. This is my favorite app of all time. When I saw that the new version was out, and the things I can now do with the Pro version, I couldn't pay my hard-earned $0.99 fast enough! I watched the update bar with impatience and now I'm like a kid at an amusement park. iOrnament is my combined art studio and science lab. Depending on my mood, it can be a relaxing therapy or an intriguing experiment. This app is well worth your time and money. I’m a jewelry artist, and I’ve used this app to create repeating patterns for etching metal and screen printing enamels. I’ve also used it to create mandalas for jewelry design in ZBrush, which I then print on my 3D printer and cast. Very, very cool. Brushes and color tools are unintuitive coming from a photoshop background. But once you get the hang of it this software is amazing! I opened up the app today not knowing there was an update!! it was super amazing already! But It blow my mind!! This update is uber awesome!! I love it!! Thank you for this awesome update guys!! Wether you're an artist or not, iOrnament is must have app. I don't get math but I do love making patterns, Mandelas and designs. It's easy to change colors, pens and design options. It's easy to share via camera roll, email and social media, even mash with other apps with the new copy and paste option. Save up to 500 pieces in the storage gallery. And most important, making these is a most relaxing way to spend your time. Some people like coloring books. I LOVE iOrnament. It's even better if you have an iPad Pro and Pencil. And now enhancing and animating the great designs with iO Crafter extends the fun, be sure to get the sister app, explore the fun of math and discover your inner artist. I've had this app for 4 years and I still love it. One of my favorite programs. Helps me be more creative in my thought processes. I absolutely love this. I was a Beta tester for all the new features and saw how much work went into this updated version. So glad it’s finally in the App Store. So easy to make incredibly complex mandalas and graphics. Thanks for a truly enjoyable app. I would recommend this to anyone who loves art like me, plus no adds you don't even have to get a premium upgrade to remove them. I think you should get this app, its so much fun! Love this app. Especially with Apple Pencil. My only suggestion would be, I wish there was a way I could flatten drawings when they’ve gotten too intricate (because they take a while to load). It’s IMPOSSIBLE TO SAVE SETTINGS otherwise, I would give this app the max!!! Super interesting & fun app. If you like doodling & seeing symmetry in your doodles, you’ll go nuts over this. Fun & relaxing. I have been wanting just an app as this. And it just got more amazing with the gradients all I can say is BOOYAH!! Love this app! Legit obsessed with this app but wish there was changes to how one is supposed to navigate through it. I honestly don’t understand why there isn’t a button that allows you to go to your own gallery without having to go through the extra step of saving your art project multiple times.. the tutorial has many spelling errors (I’m not a spelling and punctuation expert but come on now how did they get missed?) and the save option shouldn’t be so close to the trash option. There has been plenty of occasions were I almost deleted time consuming projects. One last wishlist for this app would be for automatic in-app recording this is another thing that irritates me for the lack of. Hopefully these reviews actually get looked at and considered because this app is well worth the price. I absolutely love math and I love being creative. But, most of all, I love when math and creativity merge!!! This app definitely would be worth more stars if possible! There is an optional $0.99 upgrade (USA), but the functionality without that is still phenomenal and educational. As a math teacher, I love, love, love how iOrnament offers both interactive, fun mathematical lessons behind the beauty of symmetry and the opportunity for creation with a vast array of tools and options for hands-on experiences! I HIGHLY suggest you download this app! Great product! But when I save a large format version of a fractal or tessellation, it misaligns the tiles. Love this app; the more you learn about it the more ideas and inspiration come. I cannot stop learning and creating with it!! Love this program and also highly recommend the Pro upgrade for the enhanced features, esp. layers and exporting with transparency. Easy to move creations into other art programs and then of course the sky’s the limit! Apple Pencil is very nice with this app, but I also used it with just finger pressure before I got one and the sliders make it easy to achieve a wide variety of thick/thin and opacity effects. Kids are amazed at the program but it’s also great for professional work too. 👍🏼 P.S. The developer is responsive on email, IME, which is very appreciated as well. Just learning how to use this app, fun! It is a great way to relax for a few minutes (or hours). Easy to use. Worth every penny. Perhaps my favorite app of all time. This is a great app for making repeating patterns, you can change angles and design with a large variety of presets and easily adjust the color. Allows you with a few swipes have a variety of designs and patterns. Excellent for designers! Love this. I just wish there was a way to import photos and edit/add to them. Meanwhile, so many ideas, so little time! #1 Favorite Art app Ever!!! 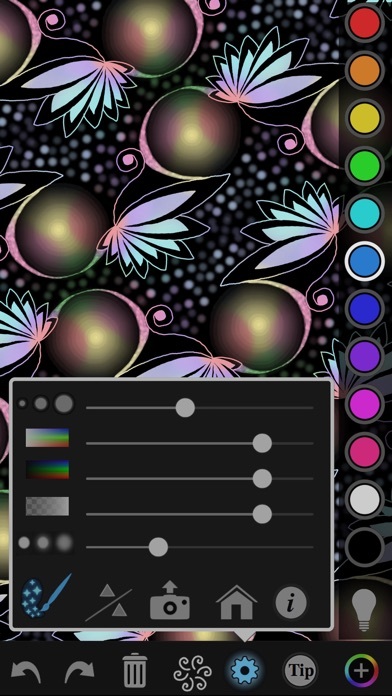 This app is a must have for anyone with an artistic mind for all ages! My 10 year old son is a talented artist and has autism. He has created some AMAZING masterpieces with this app.